Cleveland, OH – The Republican Party Platform Committee adopted draft language on Tuesday that supports defunding Planned Parenthood and extending the Constitutional “right to life” to pre-born babies. 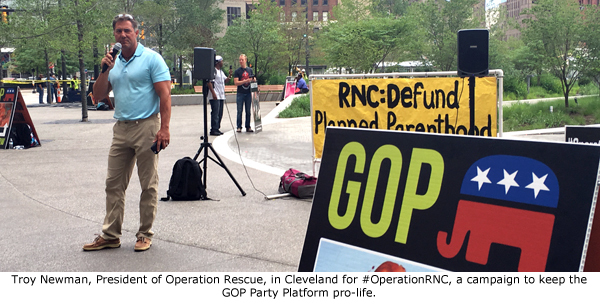 Troy Newman, President of Operation Rescue, in currently in Cleveland with #OperationRNC, which is a campaign led by Created Equal to ensure the GOP party platform remains pro-life. Newman also served as a founding board member of the Center for Medical Progress, the group that released undercover videos last year showing Planned Parenthood officials haggling over the price of aborted baby parts. The Constitution’s guarantee that no one can be deprived of life, liberty, or property deliberately echoes the Declaration of Independence’s proclamation that “all” are “endowed by their Creator” with the right to life. Accordingly, we assert the sanctity of human life and affirm that the unborn child has a fundamental right to life which cannot be infringed. We support a human life amendment to the Constitution and legislation to make clear that the Fourteenth Amendment’s protections apply to children before birth. We oppose the use of public funds to perform or promote abortion or to fund organizations, like Planned Parenthood, that perform or advocate it and will not fund or subsidize health care which includes abortion coverage. #OperationRNC also plans to fly an aerial tow banner over Cleveland today depicting a 15-week abortion will be juxtaposed to the words “Rescue Unborn Children.” See the airborne banner HERE. Newman had joined #OperationRNC leaders Mark Harrington, National Director of Created Equal, and Rev. Patrick Mahoney, Director of the Christian Defense Coalition, in Cleveland last month for statewide tour of Ohio calling for GOP platform to support the defunding of Planned Parenthood.